Valuable Tips for Managing your Spa Business – Achieve your Business Goals with These Pointers! To contribute your very best to a niche market, the spa industry has become today, read on to find out about some effective spa management tips to run a successful business. Coming up with a strategic plan involves factoring in the services you wish to provide, the uniqueness of it along with brand visibility to entice potential customers among others. Getting advice from third-party companies providing luxury spa management services including the likes of Infinite Luxury would prove ideal, as they provide owners with the latest trends, insights, and management expertise when building the brand. Providing your employees with the proper training will increase their confidence and knowledge when it comes to administering spa and wellness treatments. It will go a long way to ensure better interactions with customers. Purchasing the right sort of equipment is extremely important especially if you have just started the business, while it does not have to be costly, it should be suitable for the services you wish to provide. Offering customers exciting packages and special offers will attract greater attention from those who tend to look out for some added treatments apart from the regular services offered. Colombo is a unique metropolis, especially among those found on beautiful tropical islands with a history that spans back millennia. Here are some things about Colombo you probably didn’t know. Many believe that Colombo is the capital of Sri Lanka because it’s the largest city on the island, but the legislative capital of Sri Lanka is Sri Jayawardenapura Kotte. Colombo is in fact the epicentre of the nation’s trade, especially with foreign nations. These zones are named Colombo 1 through to 15, and can be remarkably contrasting to one another. Colombo 1 to 3 are the most metropolitan areas, and feature many of the high-end apartments in Colombo, Sri Lanka, located at the heart of the city, such as Capitol Twin Peaks. Sri Lanka does have a selection of malls and emporiums, such as Majestic City and Crescat Boulevard. If you want the champion of shopping experiences Sri Lanka has to offer, then there’s no better place than Pettah, which is the biggest open market on the island, specialising in everything from spices to high-end electronics. Early settlers to Sri Lanka arrived from all over the world, such as Portugal, India, the Middle East and England. All these groups of people influenced the cuisine of the island, resulting in some spectacular dishes such as kotthu roti, and lamprais. The major coastal town of Kalutara is situated just around forty kilometres away from the main metropolitan area of Colombo. This is a truly captivating place. Perhaps the best known aspect of Kalutara, in addition to producing of mangosteens, a popular local fruit, would be the beaches of that area. The beaches of Kalutara are generally composed of pristine powdery sands which form a barrier between beautiful Turquoise Ocean and lush tropical forest. You can also find many a Kalutara beach resort such as Turyaa Kalutara. This is a spectacular Edwardian Mansion that was built during the colonial times sometime around 1900. It depicts an interesting assortment of eastern and western influences which results in an absolutely breathtaking sight. Visiting this work of architecture is one of the essential things to do in Kalutara. This Buddhism religious site is renowned for being the only stupa in the world that is reputedly hollow. Interestingly this is one of the newer temples to have been built in the nation since its construction took place in the 1960s. Kalutara is renowned for producing some of the most colourful and intricate hand-woven baskets in the country and attracts many people eager to purchase the town’s hand-woven produce. The tourists across the world have ample reasons to reach the Maldives several times. Foremost among is the beach, which is quite silky. You can even walk on barefoot and enjoy the silky beach. The next, of course, is waters. Waters of the Maldives are crystal clear and blue, spread across the large drape of the Indian Ocean. The opportunity to choose one among several islands can count in as the third reason. In this paradise called Maldives, you can look forward to a private sanctuary among its cluster of islands. Going to the island of your choice speaks for luxury. In Maldives, luxury hotels, ultra-luxurious as well as semi-luxurious hotels are easy to come by thanks to its growing tourism. The Maldivians do not ever need to be taught on how to fish. But remember, net fishing is not allowed for commercial purposes. Go for pole and line fishing, and you will definitely love the game. More interestingly luxury hotels like Adaaran Club Rannalhi will prepare the cuisine as well for you from your catch. You can also find inspiration for a new sport. It could be anything from Catamaran Sailing, Kayaking, Snorkelling, and Kite surfing to riding in glass – bottom boats or dinghies. When you are tired at the end of the day, retreat into a dining experience by candlelight on the beach. Snorkelling is what most tourists vie for when they reach the island. Maldives is home to safe and convenient lagoons for snorkelling and you will get to swim along with schools of colourful fish. The Maldives is considered the lowest country in the world, with its highest elevation just 2.4 metres above sea level. Do not forget to meet a local or two. They will inspire you with their positive attitude of life. They live life to the fullest with happiness. The seaplane is another exceptional expedition in the Maldives. As you take off and continue over the waters, it is your turn to set sights on the beautiful cluster of islands. The State of Qatar, one of the most prominent nations in the Middle-East is a land that is almost synonymous with luxury. The nation boasts the third-largest natural gas reserves in the world and is renowned for its high-income economy, as well as its high rate of human development. Its capital city of Doha boasts one of the most iconic skylines in the world, with many eccentric and eye-catching works of architecture to be seen. Due to its opulence, Doha luxury hotels are plentiful, with many to choose from such as the Banana Island Resort Doha by Anantara, with each of them showcasing experiences that are the stuff of dreams. 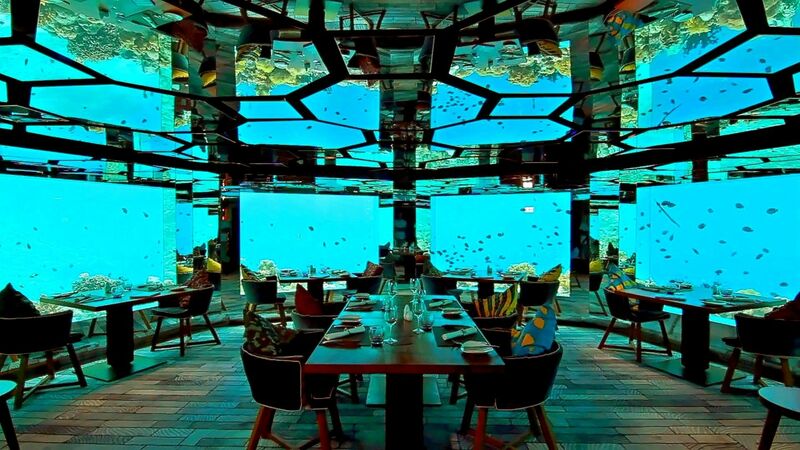 One of the newest of these experiences in recently is the brainchild of a company by the name of HamacLand and their concept is the realisation of a vision of ‘land meets sea, and sea meets sky’. The end product is the HamacLander, which comes in two distinct types. Each of these can be described by the company as a ‘personal island’ of sorts where families and friends can relax together. At first glance these incredible inventions seem like floating decks equipped with a number of hammocks, seating facilities, and a variety of customisable features. All models can feature waterproof cushions, four hammocks made with Serge Ferrari fabrics. One of the most unique options is a waterproof bean bag that also floats. Since the company is fairly new, there are some upcoming facilities such as retractable sun-decks and teak tables. The Nicelce model is the more feature-packed of the two, and can be further upgraded upon request with features such as solar panels and a water tank with a shower. These are truly the latest innovation in the field of luxury and are super to be making appearances in the abodes of the most privileges as well as the most elite luxury hotels Qatar has to offer.